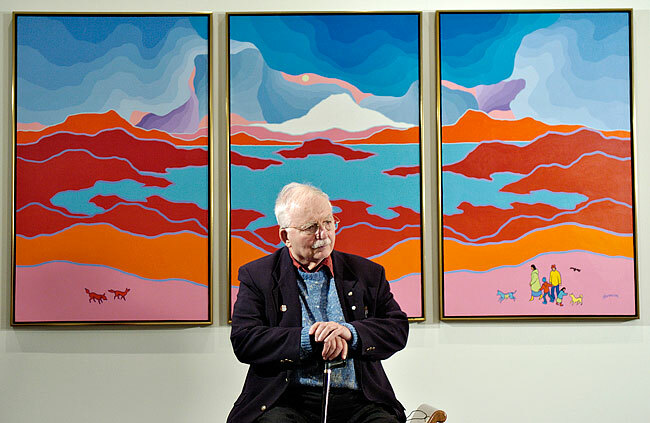 Ted Harrison is one of Canada’s most popular artists. His love of the land and people of the Yukon has brought him national acclaim. His distinctive style of painting is both colourful and sophisticated yet retains an innocent charm, and appeals to young and old alike. Edward Hardy Harrison was born August 28th, 1926 in Wingate. Ted attributes his early interest in art to the encouragement and support from his parents, particularly his mother who had an interest in fashion design and photography. Wellfield Grammar school teachers recognized his talent and urged him to further pursue his artistic dreams by going to Art College. In 1943, he enrolled in Hartlepool College of Art and began to study art and design in earnest, but the Second World War interrupted his education. Following military service, he returned to art school and in 1950 received a Diploma in Design. 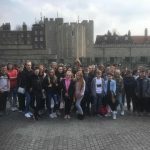 The following year he received a teaching certificate from the University of Durham and began a twenty-eight year career in education. Ted, who had a great interest in travel, then taught in many different parts of the world, including Malaysia, and New Zealand, before immigrating to Canada with his wife Nicky, and their son Charles. They settled in the small town of Carcross just outside Whitehorse, in the Yukon.